With awe-inspiring special effects undermined by a childish script and hackneyed love triangle, Twister is only tolerable when all the characters shut-up and the twisters are allowed to roar. Former expert storm chaser Bill Harding (Bill Paxton) is settling down to a career as a television weatherman, and about to marry Dr. Melissa Reeves (Jami Gertz). He just needs to finalize his divorce papers from first wife and former storm-chasing partner Jo Harding (Helen Hunt), who still leads a ramshackle tornado chasing team. Jo has a burning passion to improve the science of predicting tornadoes, having lost her dad to a twister when she was a child. What should be Bill's final quick visit to Jo's camp turns into a wild storm-chasing adventure when a series of wild twisters descend onto the landscape. Bill's old competitive juices are reignited, not to mention his lust for Jo, as he leaves Melissa twisting in the wind and joins Jo's crew as they attempt to place a new scientific device in a twister's path to gain valuable scientific data about the innards of tornadoes. Competing with them is a well-funded research team led by Jonas Miller (Cary Elwes), who used to be part of Bill's crew before going corporate. 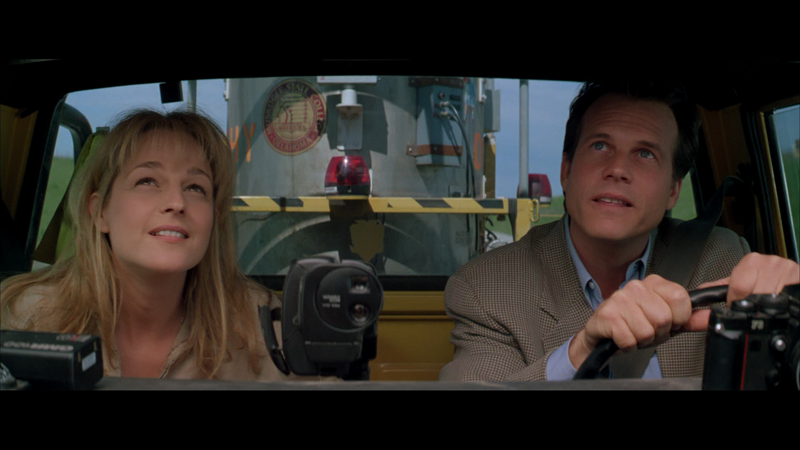 Helen Hunt does her best to carry the acting load, but even she struggles with a script (by Michael Crichton and Ann-Marie Martin) written at Grade 5 level and assembling the most puerile of plot elements and throwing them together with no attempt at sophistication. The Jo / Bill / Melissa triangle is a candidate for the most contrived - and physically annoying - romantic entanglement ever placed on the screen, while the mostly faceless Jonas team motoring along in their black motorcade check off every trite and overused "bad guys" stereotype in the beginner's guide to writing screenplays. Bill Paxton is far from ready to carry the male lead in a big budget production, and his performance is firmly bogged down in stiff daytime soap quality. Cary Elwes is even worse, and his battle against stock antagonist mannerisms is lost in his first scene. Philip Seymour Hoffman, in a predictable but at least entertaining role as an unkempt member of Jo's team, is left to add some supporting colour. Twister is much better whenever the storms move in and the chase teams gun their engines and start to race towards the path of destruction, attempting to get as close as possible without getting swept up into the swirling debris. The tornado special effects are powerful, loud, impressive and immersive, director Jan de Bont clearly in his element brushing his cast up against momentous disaster. Twister's final 30 minutes is one long chase of a massive, destructive series of tornadoes, and the film finally hits its stride, the true star of the show proving to be the Industrial Light and Magic special effects crew. But in this case the special effects just make Twister watchable, not necessarily enjoyable. The film's soul is a swirling emptiness lost in the middle of a large tornado.